Agent24, now part of this complete breakfast! It’s so mainstream that it hardly qualifies as “novelty,” but I have a soft spot for breakfast foods that pay homage to 15th century Romanian princes. 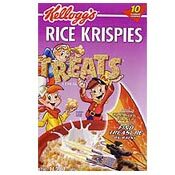 This is all that Rice Krispies were good for anyway. They just cut out the middleman. Wouldn’t it have been better to have a “Mario Bros.” line of pasta and sauce? I’m just saying. I don’t know what’s more disturbing: the fact that this cereal was actually made or that the picture in the link is actually autographed. I have no recollection of this cereal, which is odd because I spent an inordinate amount of time in the cereal aisle as a kid. Maybe it was healthy. If you’ve ever eaten this cereal, I’m going to guess that you never went to prom either. Bonus points if you cried into a bowl of C3P0’s on prom night. 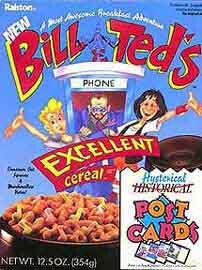 I wish I could use their time-travelling phone booth to go back and beg my mom to buy this cereal. Or I could go back, buy it, and leave it in my cupboard for me to find right now. The weird thing is that I’ve actually had this cereal, but never one of their actual donuts. Check out the photo of the Swedish Chef on the box. Not only does this cereal exploit the accent of a foreigner (neoprene though he may be), his mouth also looks vaguely vaginal. Again, I’m just saying. .-= Delhi Bed And BreakFast’s last blog ..Delhi Bed and Breakfast (b&b) Accommodation – BNB New Delhi, India =-.